Inaction Is Not an Option: TREAT: WHAT ARE ANTIRETROVIRALS (ARV)? What are ARVs? As defined by the World Health Organization (WHO), antiretroviral drugs or antiretrovirals inhibit the replication of HIV. The aim of this drug treatment is to keep the HIV in an infected person's body at a low level. Unfortunately, ARV treatment is not a cure, and the drugs must be taken everyday for life in order to maintain the effectiveness. How do they work? Usually ARVs are taken in combination, or more than one at a time. The reason is HIV is a persistent virus, and if only one drug was taken as treatment, the virus would quickly build up resistance and render the drug useless. 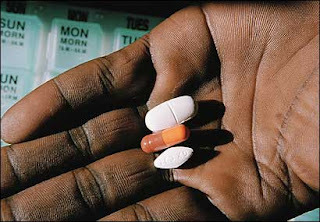 Note: Taking three or more ARVs at a time can also be referred to as Highly Active Antiretroviral Therapy (HAART). With a combination of ARVs, the rate that the HIV resistance would develop is drastically reduced. This delays the HIV replication of itself, and in turn, the immune system deterioration. Effective ARV treatment helps to prolong the life of an infected individual, slowing the illness and allowing a better quality of life and health. How many different types of ARVs are there? According to the AIDS charity AVERT, there are now more than 20 approved antiretroviral drugs, and 5 different classes into which the ARVs are grouped. ARVs has been able to sustain millions of lives around the world, however there are still millions more who are in desperate need of this life-saving medication. For further information on the different types of ARVs and how they work, be sure to check out http://www.avert.org/treatment.htm.